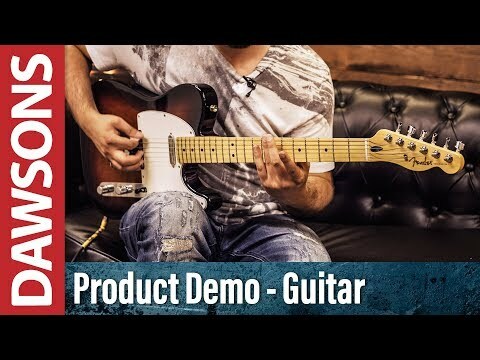 The Fender Player Series Telecaster MN Electric Guitar adheres to the classic single-cutaway body profile that has influenced every musical genre and marries it with a sublime playing feel to suit modern performers. The solidbody design of the Tele' has been adopted by guitarists around the world for decades who crave a robust yet undeniably playable model that offers peerless reliability. Whether you're playing the pub circuit or taking to the stadium stage, the Telecaster is a workhorse that can be as tireless as you are. The Fender Player Series Telecaster is built using lightweight alder, which is also prized for its balanced tonal offering. The combination of solid rigidity and lightweight feel create a winning partnership. The single-cutaway body profile affords easy access to the upper frets to give you the freedom to roam in comfort. The paintwork is protected by a coating of gloss polyester to enable it to age gracefully over the years. Joined to the body is a durable maple neck, which is shaped to the modern "C" profile for comfort whilst offering a lightning fast playing feel. The back of the neck is lavished with satin urethane to prevent unwanted stickiness or tackiness from impeding your fretting hand's movement during performances. Paired with the neck is a bright-sounding maple fingerboard, which is home to 22 medium-jumbo frets to explore. The addition of the 22nd fret alongside the 9.5-inch fingerboard radius affords an increased tonal range whilst retaining a natural fit and feel in the hand to promote seamless string bends and elaborate technique. The body is home to a pair of Player Series Alnico 5 Tele single-coil pickups fitted in the neck and bridge positions. Though the control layout may be delightfully simple, consisting of a 3 position pickups selector switch, a master volume pot and a master tone control, the Player Series Tele' is every bit as versatile as you'd expect it to be. The clue is in the name with this model and this is definitely a model that has been designed with the hardworking players in mind. The body is home to a 6-saddle string-through-body Tele' bridge with bent steel saddles to anchor each string securely whilst promoting imperious intonation and sustain. The headstock is home to standard cast/sealed tuning machines, which uphold tuning integrity throughout the most energetic of performances. Each model is strung with Fender USA strings to get you off to a flying start.